Vertebrate circulatory systems. Oxygen-rich blood is shown as red and oxygen-poor blood as blue. (a) In fish, the heart has one atrium (A) and one ventricle (V). Blood oxygenated in the gill capillaries flows directly to the capillaries of the systemic circulation without first returning to the heart. (b) In amphibians, the single atrium is divided into two separate chambers. Oxygen-rich blood from the lungs enters one atrium, and oxygen-poor blood enters the other. Oxygen-rich blood is pumped from one ventricle to the body tissues, while oxygen-poor blood is sent from the lungs to the skin, which is a major respiratory organ in amphibians. (c) In birds and mammals, the atrium and ventricle are divided into two separate chambers, forming two hearts. One pumps oxygen-rich blood through the body, and one pumps oxygen-poor blood through the lungs. and oxygen to their tissues, remove wastes, transport hormones , equalize body temperature, and maintain homeostasis. Circulatory systems are classified as open or closed. In an open circulatory system, the heart pumps a fluid through arteries that empty into a large space, the hemocoel. The fluid bathes the organs in the hemocoel, and returns through veins to the heart. Since there is no distinction between blood and tissue fluid in such a system, the fluid is called hemolymph. Open circulatory systems are found in most mollusks and arthropods . In a closed circulatory system, blood never leaves the blood vessels, and is thus separated from the tissue fluid. Blood flows away from the heart by way of arteries and returns to the heart by way of veins. Arteries are connected to veins by tiny, thin-walled capillaries. Arteries and veins have a wall made of elastic and muscular tissue, and an inner lining of thin epithelium called endothelium . Capillaries are made of endothelium only. This thin wall allows for exchange of substances between the blood and tissue fluid. Closed systems have a relatively high blood pressure. This enables nutrients and oxygen to be delivered quickly to their tissues and supports the high metabolic rate associated with the relatively high mobility of some animals. Squids, for example, have closed circulatory systems with three hearts, one to serve each gill and one for the rest of the body. Earthworms, although not highly mobile, have a closed circulatory system with five pairs of hearts. Vertebrates independently evolved closed circulatory systems in close association with the respiratory systems. In fish, blood flows from the heart to the gills for gas exchange, then to the rest of the body, and finally back to the heart. This is called a single circulation since the blood flows through the heart only once during each complete trip around the body. Amphibians evolved a double circulation; blood flows from the heart to the gills or lungs for gas exchange, then back to the heart to be repressurized before flowing to the rest of the body. The vessels that serve the respiratory organs are called the branchial circuit (for gills) or pulmonary circuit (for lungs). Vessels that serve the rest of the body are called the systemic circuit. The amphibian heart and most reptilian hearts have only three chambers—two atria and one ventricle —and there is some mixing of oxygen-rich and oxygen-poor blood in the single ventricle. Endothermic vertebrates, the birds and mammals, have higher metabolic rates and require stricter separation of the pulmonary and systemic blood. Thus, they have four-chambered hearts. 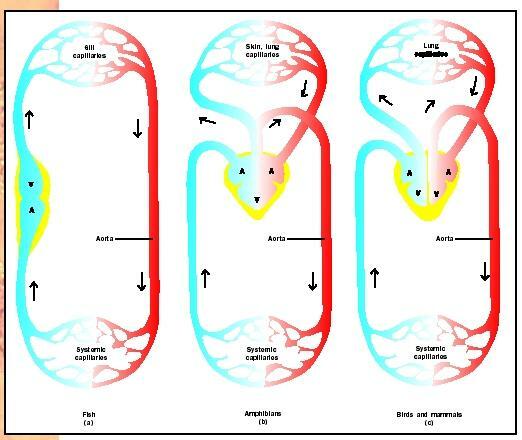 Oxygen-rich blood flows through the other ventricle to the systemic circuit. Walker, Warren F., Jr., and Karel F. Liem. Functional Anatomy of the Vertebrates: An Evolutionary Perspective, 2nd ed. Orlando, FL: Saunders College Publishing, 1994. What is the relationship between transport system and circulatory system? hi! thanks for the info. in the article it is very useful, i have gained a lot . now i have a question , what are the characteristics of the circulatory system of the class osteichthyes,amphibians,reptilesand aves?